We have thousands of properties for sale all over France. But we've no property for sale in Lorient at the moment. And that's something we want to change. If you have a property to sell in Lorient (or nearby) then act now to get a 50% discount. Just place your advert in the normal way (Click here to place your advert). Then send us an email quoting "Lorient" and telling us that you you saw this offer. The town of Lorient, in the Morbihan district of southern Brittany, is a seaport town which once housed a huge German submarine base. Because of this base, Lorient was the unfortunate target of many Allied bombing raids during World War Two, and much of the city was destroyed. It was rebuilt after the war, and has since established itself as a thriving centre of commerce. It is now home to France's second largest fishing fleet. If Lorient can be said to lack some architectural character, due to the loss of its original buildings and their replacement by 1950s-style constructed houses, it must also be said that the town is fortunate in its lovely port and marinas. These add colour, character and a sense of gaiety to the town. The fishing port is still very active, and makes dining out in the town a real delight for those who love fresh seafood. The sailing boats that throng the marinas are pretty and help to form a picture which beguiles tourists and gives a great kick-start to the town's economy. Lorient has several interesting places to visit, and one of these is the old submarine base. There is also a fascinating museum which charts the history of trade with the Indies, Lorient having taken its name L'Orient from the eastern connection which was once the mainstay of the economy. The beaches around Lorient are lovely, sandy and protected from the wildest winds making them a draw for holiday makers. You can also take a boat trip to the Île de Groix, which has some of the most glorious beaches in Brittany. Brittany has a gastronomy all of its own, and nowhere is this more celebrated than in Lorient. The fresh seafood is superlative, and together with the delicious crêpes and cider of the region there is little in France that can compete if you are seeking to enjoy excellent regional food, simply served with pride in one of the many good restaurants. If you enjoy shopping in France... and who doesn't… then Lorient should please you as the town has good selection of shops with both supermarkets and the practical and smaller shops for charm and local colour. The separate nature of Brittany has led to a stronger connection with Celtic traditions than is felt in many parts of France. Lorient celebrates this with a festival of Celtic music held every year, and this attracts a massive gathering of musicians and followers, and is really worth trying to catch. This southern part of Brittany is ideal for lovers of outdoor sports. Being close to the sea means that you can access all manner of sea sports, and the town also has facilities for tennis, swimming, cycling and walking. The airports of Brest and Dinard are both near enough to make air travel a simple and pleasurable way of accessing the town. Dinard is served by Aurigny and Ryanair, while Brest is served by flybe and Ryanair. 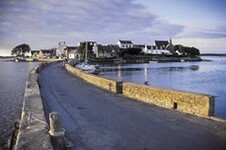 Ferry travel is another possibility, and the nearest ferry ports are found at St Malo and Roscoff. Lorient offers many possibilities for buying property, and is a particularly good place to look if you are considering purchasing property to use as a B&B or a gîte. 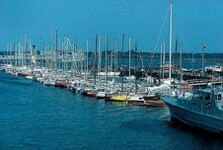 The tourist trade is well established in Lorient, so you should be assured of future business. Prices are following a steady upward trend in and around the town, making it a sound investment. Do you know Lorient better than we do? Do you have photos of Lorient? Lorient is located in north-western France, in the south-west of the Morbihan department. Access: By air: Fly to Dinard or to Brest. By boat: The nearest ports are those of St Malo and Roscoff, though the ports of Caen and Cherbourg are also within reasonable reach. Economy: The economy is strongly affected by tourism, although the fishing port is also influential. Interesting fact: The town is largely constructed in a 1950's style, due to the fact that most of the original town was destroyed by Allied bombing raids in World War Two.